The main character Dilbert is supposed to be a nerdy engineer who has to suffer the fools who are his co-workers and bosses. Presumably he is Adams’s alter ego. An engineer is unlikely to say something like this since the entire discipline is based on using sampling techniques to estimate the likelihood of outcomes. 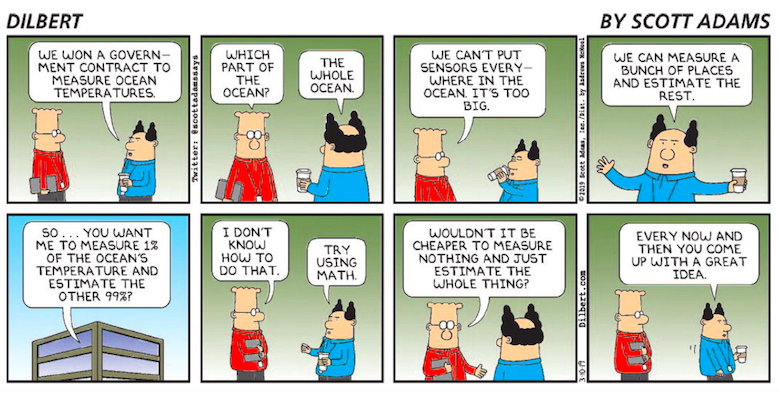 In fact, this cartoon would make some sense if the dialogue between the pointy-haired boss and Dilbert was switched, since the boss is the person who is ignorant of basic science, engineering, and even logic. Adams’s educational background is in economics and management, not engineering. But economics, like most disciplines, also uses sampling because it is an invaluable tool of research, so there really is no excuse for this cartoon other than as serving Adams’s crusade against climate change research. And WTF does “measure 1% of the ocean’s temperature” even mean? You’d need a hell of a lot of sensors to cover 1%. But you don’t need them. I’d imagine a few hundred would easily suffice for reliable averages. For surface temps anyway. Dilbert still exists? And it’s actually published? I stopped paying attention in the mid-90’s when it became clear Scott Adams was an idiotic nut. Economics seems to be a fertile ground for people to get credentials while making child-like assumptions. Seems right up Scott Adams alley. There are a few good ones, and so many bad ones. I’m more worried that Scott Adams doesn’t appear to believe in weather satellites. We’re not even measuring 1%. We are just measuring a small volume, maybe a liter or so, around the temperature probe and assuming that it isn’t 100 degrees hotter 5 feet away! What HJ said was my first thought as well. So is Adams a satellite skeptic as well? What’s even stupider is he probably trusts the thermometers and current weather reports when it says it’s something like 71F outside. Those thermometers only measure something like 0.0000000000000001% of the air! For all he knows it could be boiling outside. Not quite accurate. He is Adams’s impression of the engineers he worked with, back when he had a job. He (Adams) has never pretended to technical qualification himself. In fact, in the 90s he made no secret of the fact that a significant quantity of his material came from the emails he received from readers, many of whom were working engineers who identified with Dilbert. One of his shrewdest career moves was including an email address in the space between the panels, back in the days when such a thing was unheard of. It gave him a near-constant stream of material to make cartoons out of. Getting your audience to write your material for you is a pretty neat trick. Hes actually using something that most (software) engineers would recognise -- management asking for estimates based on a bunch of unverified assumptions and with not much data . He is however using that to promote his ideology (Im guessing he would also complain about the increasing SJW influence on comics). I did have the same thought as the rest of your commenters that when someone says the temperature ain this city is X , how he thinks its being measured.